Value style include stocks with a price that is relatively low, given the anticipated per-share earnings, book value, revenues, cash flow, and dividends that the stock provides to investors. Growth style include stocks whose per-share earnings, book value, revenues, and cash flow are expected to grow quickly relative to other stocks in the same scoring group. The weights in the portfolio’s style box are calculated by aggregating the style box weights of the portfolio’s constituents (funds, ETFs, stocks). The average style is a weighted average of the portfolio's constituent weights. The weights in the box add to 100%. 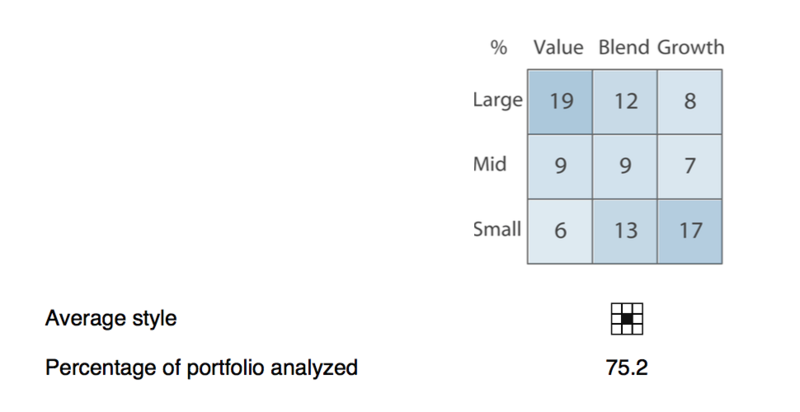 They are based on the percentage of portfolio analyzed (which is the total weight of stocks in the portfolio).